First it was a church, then a lodge, now a home. Martha’s Vineyard is a sanctuary for the McCormick family. The off-season is spent in Boston, where Jeffrey McCormick works in venture capital and Christine McCormick shuttles three teenagers (Jacqueline, Aiden, and Kristen) between school, sports, and activities. In the summer, they head to the Vineyard for long days on the beach, bike rides, and dinners on the back porch. It’s a sacred time, full of family respite. It helps that their Vineyard home was once a church. The McCormick family lives on School Street in Edgartown in the Old Baptist Church. Completed in 1839, it was designed by the Vineyard’s first architect, Frederick Baylies Jr., in the Greek revival style. 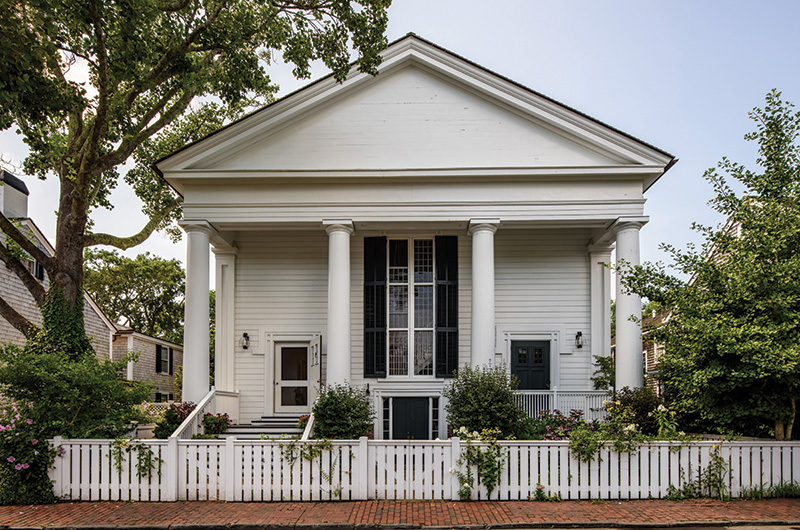 Its towering Doric columns and symmetrical dual entrances stand apart from the typical captains’ houses in downtown Edgartown. It looks like the little sister of the Whaling Church, which was also designed by Baylies a few years later, in 1843. In fact, passers-by unfamiliar with the house’s history have been known to speculate as to what could be inside. When it was built, the building was just a wide-open room with a choir loft, which suited the needs of a church just fine. A few years later it was raised above street level to put a vestry on the ground floor. In 1945 the Baptist congregation moved to the current Federated Church on South Summer Street in Edgartown, and two years later the imposing School Street building was leased to the Masonic Oriental Lodge. The building is cavernous, though, and eventually the heat payments and maintenance wore heavy on the masons. In 1980 the lodge moved, setting in motion the building’s third transition, this time to a private home. Still churchlike on the outside. At some point over the years, under a succession of owners, the roof was redone with asphalt shingles and the siding was replaced with vinyl. Carpets were laid down, the choir loft and windows were boarded up, and the porch began to sag off the front. Though still churchlike on the outside, the interior was unrecognizable. Christine first came to the house when it was owned by Jay and Françoise Theise, the third set of private owners. She worked for Françoise in Boston and immediately fell in love with the building’s stately presence and its rich history. She and Jeffrey rented the home for a week for two summers before buying it in 2003. Neither of their families had owned a summer home growing up, and they immediately began thinking of the possibilities of the house. They wanted it to be a gathering place for family and friends. They wanted it to be open and inviting. They wanted to respect the building’s history. They had a lot of work to do. “I had this desire to rescue it in some sense,” said Christine, who studied architecture in college. She reached out to old friends from the School of Architecture at the University of Miami, Frank Martinez and Ana Alvarez, who own a firm in Miami. 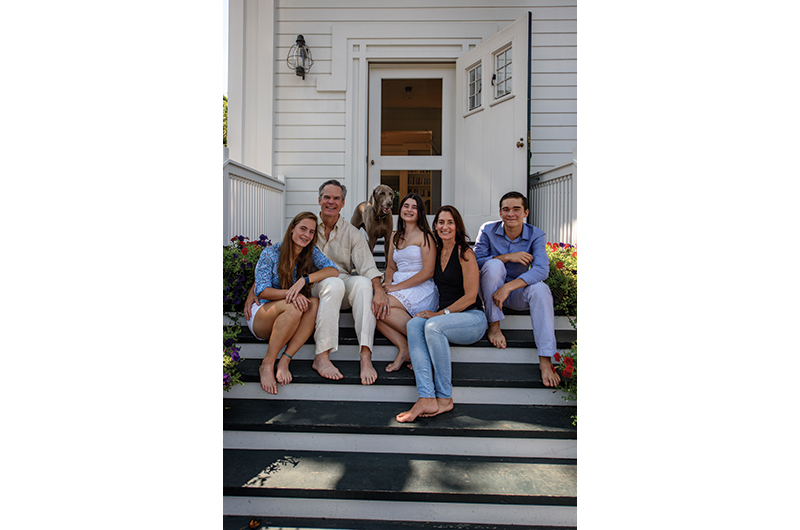 Besides being close friends, Christine knew Martinez, Alvarez, and their then-partner Juan Caruncho had the skill to create a comfortable and modernized home while respecting, celebrating, and rediscovering the historic quality of the church. The building has been redesigned into a comfortable and functional family space. “It somehow worked, even though it sounds crazy. Its complicated, but it worked beautifully,” said Christine. The rescue mission began with research trips to the Martha’s Vineyard Museum and other Baylies churches. Then they gutted the building to the studs. “We had to take all of that away to uncover, or get back to, the original body of the building, the original body of the church,” said Martinez. They finished the basement, a particularly important step for Jeffrey. It’s now used as a teenage hangout and a laundry room. 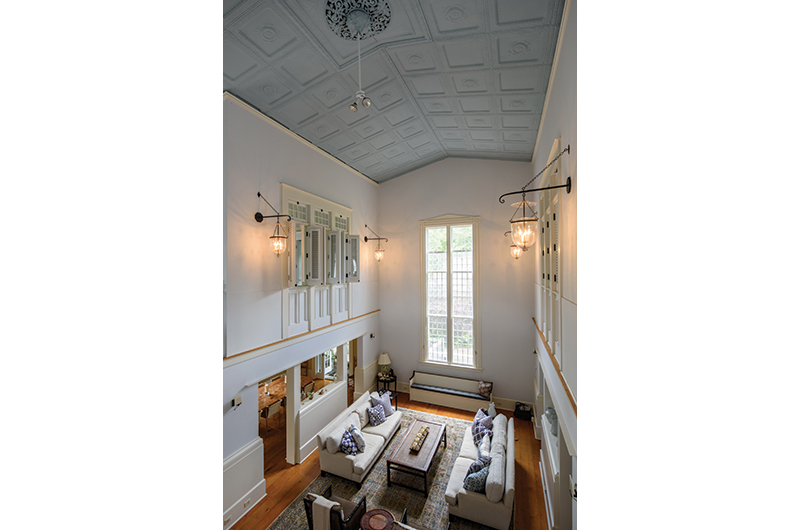 The house flows from the two front doors that lead down symmetrical hallways toward the living room with its high tin ceiling, original to the church and painted robin’s egg blue. To create a comfortable living space, the architects stuck to defined rooms, large landings, and several stairways. “We don’t like spaces that bleed; we like spaces that have an identity and can be furnished,” said Martinez. On the first floor a small library, formal dining room, kitchen, office, and powder room occupy the sides of a large central living room. Underneath the choir loft, which has been expanded from its original size, is a cozy television den. The second story of the house runs along the edges, leaving the middle open. Martinez compared it to a megaron, the central great hall of ancient Greek palaces. There are four bedrooms, one in each corner, each with their own bathroom. The bedrooms have windows to the outside as well as windows looking out over the living room. Custom shutters, inspired by Cuban persianas, allow people in the upstairs rooms to regulate the amount of privacy they want. The addition of a trellised porch was the only change to the church’s footprint. The new layout creates a villagelike feel in the center of the home. With its symmetrical pacing, the interior composition has some formality but the overall feeling of the home is welcoming and relaxed, imbuing it with the sense of community and openness that Christine wanted to achieve. In general, they kept the interior design light, airy, and elegant without being too formal (wet bathing suits and their dog Aquinnah are both allowed on the sofas). Three original church pews that were found in the basement have been incorporated into the design; one is used for shoe storage in a front room. They restored the original doors and windows and uncovered beautiful wide-planked pine floorboards hidden beneath carpet and layers and layers of paint. 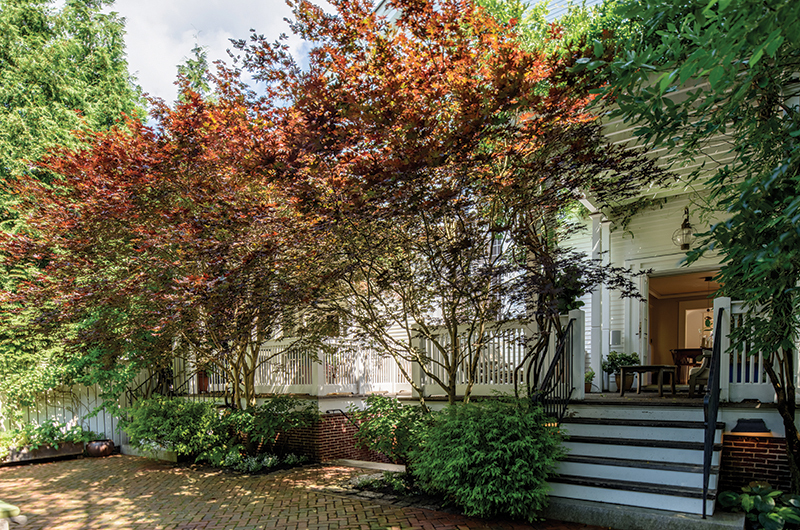 The only change to the footprint of the building is the addition of a trellised porch in the backyard. There you’ll also find the mark of another church: Trinity Church in Boston’s Copley Square, where the McCormicks were married and their children were baptized. Pieces of granite, salvaged during a renovation project, line the yard and driveway. Jeffrey and Christine McCormick with daughters Kristen and Jacqueline and son Aiden. While most of the activity now in the Old Baptist Church is regular family fun, the McCormicks have hosted one wedding. One of Christine’s oldest and dearest friends planned to get married on the lawn at the Edgartown restaurant l’étoile, but the weather turned. They made a quick decision to hold the wedding in the house instead and ran to the flower shop. “We moved the sofas, we had chairs lined up, she had the aisle she came down, it was really sweet,” remembered Christine. While not every day features a wedding, each Vineyard day holds some magic for the McCormicks. Christine looks forward to hearing the bells from the Federated Church in the morning, making rounds to pick up goods from various Vineyard farms and shops, and spending time with family. “When we’re here, we’re really together as a family without the distractions of school and work and running around. It’s really a time to regroup and re-center as a family,” she said. And for the McCormick kids, all young when the Old Baptist Church was redesigned and restored into their summer home, the Vineyard house holds something especially special. “The little one, at one time, I remember saying, ‘Mom, when can we go home?’ and she meant here,” Christine said.